It can happen at any time: You get a request, as Admin, from your company, to provide the contents of somebody's mailbox from a backup set as part of an investigation. The Recovery Storage Group is usually the easiest way to do this. It may either mean using the Exchange Management Console or the Exchange Management Shell. 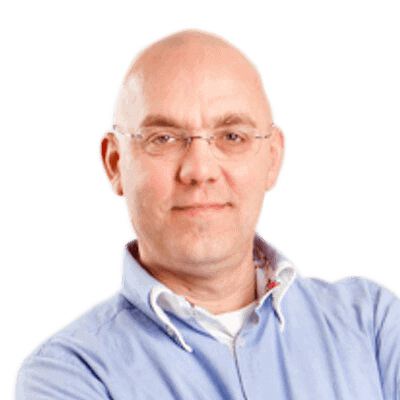 Jaap explains all. Very recently I was at a customer and the Exchange administrators had received a request from the legal department to retrieve somebody’s mailbox from several backup sets and create .PST files of the inbox. The .PST files had to be handed over to the legal department. Of course the particular user was not aware of these actions. The Exchange administrator retrieved the Exchange database files from backup (130 GB!) but had absolutely no idea how to retrieve the mailbox data out of the files. The Recovery Storage Group in Exchange Server 2003 and Exchange Server 2007 can be very useful in a situation like this. This particular customer made a full backup of their Exchange Server 2003 database every weekend and every night an incremental backup was created. This means that during a normal night the Exchange Server database is not backed up, but the Exchange Server log files are backed up and purged from the disk. Please refer to my article “Online Exchange Backups” on Simple-Talk.com for more information on these backup techniques. If data from a mailbox out of a backup that’s 14 days old needs to be retrieved you have to get that backup set, but you cannot just simply restore the database to its original location. In order to restore the database to its original location the database needs to be dismounted and the 14 days old backup has to be restored. This not only results in an outage but will also result in a loss of data if you’re not careful, so this is not an acceptable option. Also you have to restore the full backup made during the weekend, and possibly one or more incremental backups, depending on the date stamp you have to restore. A Recovery Storage Group is like any other Storage Group, except for the fact that databases mounted in a Recovery Storage Group do not contain live mailboxes but only disconnected mailboxes. A Recovery Storage Group is a Storage Group that can be used for recovery purposes; you can restore a database from a backup set in a Recovery Storage Group and recover data from it. A Recovery Storage Group and the database(s) it contains are invisible to the end-users and Outlook clients, only the administrator can access the Recovery Storage Group and the database(s) it contains. 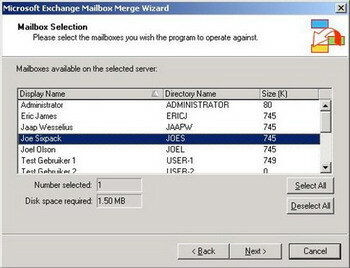 Suppose there is a user in our Exchange Server 2003 environment named Joe Sixpack. Joe is under suspicion of the legal department and the legal department has requested a copy of his mailbox to check whether Joe has sent out some confidential information to the Internet. 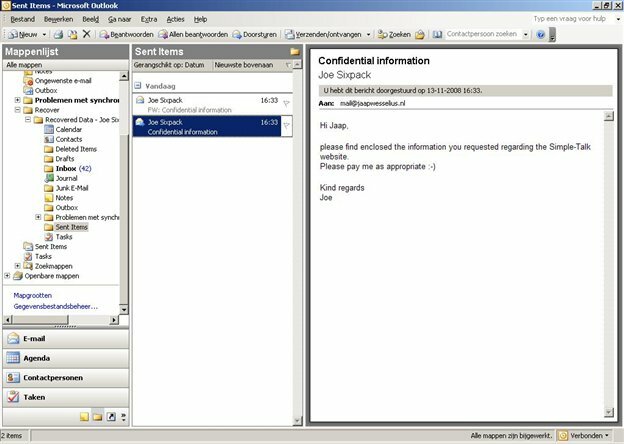 Joe’s mailbox is located on an Exchange server named 2003SRVR in the default mailbox store in the First Storage Group. This Storage Group contains three databases in total. There’s also a second Storage Group that hosts only one Mailbox Store. 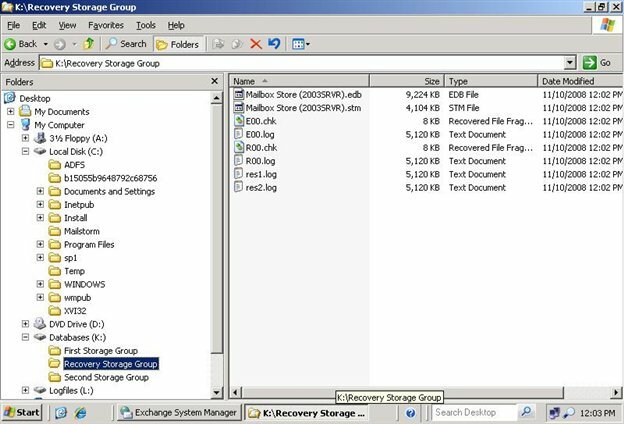 To retrieve a copy of Joe’s mailbox the IT department wants to use the Recovery Storage Group option in Exchange Server 2003. An empty directory is created where the database and the log files will be stored. When the Recovery Storage Group is created the database that needs to be restored must be selected. The database is now created in the Recovery Storage Group in Active Directory. The next step is to restore the database from the backup set. No additional steps are needed here. When a Recovery Storage Group is created the behaviour of an online restore is changed. 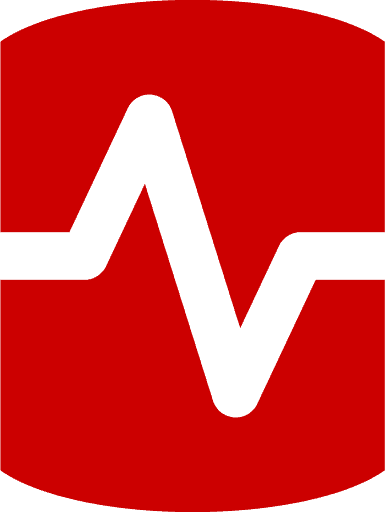 The database is not restored to its original location, but it is automatically redirected to the Recovery Storage Group location that’s created earlier. Just restore the “Mailbox Store (2003SRVR)”, it will be automatically placed in the right directory. In a normal Storage Group in Exchange Server 2003 the log files have a prefix like E00, E01, E02 or E03. In a Recovery Storage Group the prefix is R00. This way it is always clear when a particular directory contains data from a Recovery Storage Group. After the Exchange database is restored from a backup set it can be mounted. Just right click this database in the Recovery Storage Group in the Exchange System Manager and select “Mount Store”. 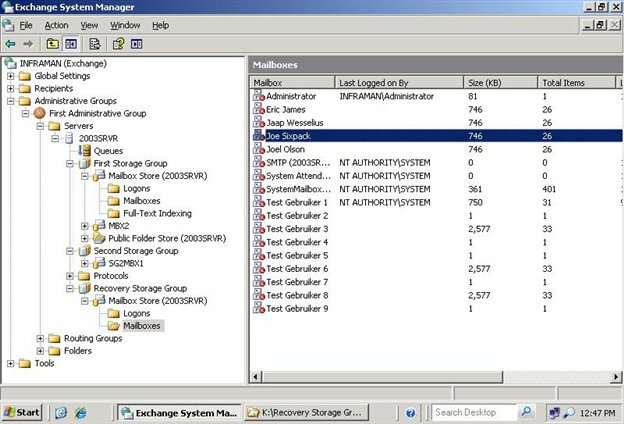 Remember that the database in a Recovery Storage Group is actually an old version of the running database, so it also contains all mailboxes that are in the running database. In the Recovery Storage Group however these are disconnected mailboxes, i.e. the original user accounts in Active Directory are matched to the mailboxes in the running database. Figure:2. After mounting the database in the Recovery Storage Group contain disconnected mailboxes. Save the settings (default selection) and watch the export process going on. When the operation is completed successfully click Finish. Joe Sixpack’s mailbox that was in the backup set is now saved in the .PST file on local disk. This .PST file can be handed over to the legal department for further investigation while Joe Sixpack never noticed anything about the whole operation. The Recovery Storage Group functionality is also implemented in Exchange Server 2007, but it is not available through the default Exchange Management Console interface. To perform all operations with a Recovery Storage Group the Exchange Management Shell needs to be used. You can use some Recovery Storage Group functionality using the toolbox in the Exchange Management Console; I will explain this later in this article. [PS] C:\>New-MailboxDatabase -MailboxDatabaseToRecover "Mailbox Database"
-StorageGroup MBXSERVER\RSG -EdbFilePath "k:\rsg\mailbox database.edb"
[PS] C:\>Set-MailboxDatabase -Identity "MBXSERVER\RSG\Mailbox Database"
Before the database can be mounted, the database should be restored from the backup set. When a Recovery Storage Group is created the restore is automatically redirected to the Recovery Storage Group by the Information Store, just like in Exchange Server 2003. Restore the database using your backup application. [PS] C:\>Mount-Database -Identity "MBXSERVER\RSG\Mailbox Database"
Now the Recovery Storage Group is created, the mailbox database is created, restored from the backup set and mounted. It is still invisible to the end users and no one except the administrator can access the mailbox database in the Recovery Storage Group. Please remember that it is only accessible through the Management Shell, so colleagues using the regular Exchange Management Console also do not notice anything. Swap databases for “dial tone” scenario. When the database is mounted the database statistics can be requested of the database in the Recovery Storage Group with the Get-MailboxStatistics cmdlet. These are disconnected mailboxes and are unknown to Active Directory. As far as Active Directory is concerned the actual mailboxes are located in the “mailbox database.edb” in the First Storage Group. Joe Sixpack’s mailbox is clearly visible. [PS] C:\>Get-MailboxStatistics -Database "RSG\Mailbox Database"
to use this cmdlet Outlook 2003 SP2 (or higher) has to be installed on the server where the cmdlet is run. This can be a management workstation (or a management server) with only the Exchange Management Tools installed. It should also be a 32-bits server since the 64-bits Exchange Management Tools cannot cooperate with the 32-bits Outlook client software. To Export-Mailbox cmdlet runs only against a normal Exchange Server 2007 SP1 database and not against databases running in the Recovery Storage Group. When the Restore Mailbox operation is running a progress bar is shown. When the Restore Mailbox operation is finished the contents of Joe Sixpack’s mailbox is available in the Recovery Mailbox. When using Outlook to access this mailbox the contents is available in the \Recover folder in the mailbox. The \Recover folder in the Recovery Mailbox can be exported using Outlook, in the File menu select the “Import and Export option” and then select “Export to a file”. Follow the wizard to complete the export to a .PST file. Export-mailbox -identity "Recovery Mailbox" -PSTFolderPath c:\temp\joesix.pst -IncludeFolders "\Recover"
This will export the contents of the \Recover folder, and therefore the recovered mailbox from Joe Sixpack to a .PST file in the c:\temp directory on the local disk. Another interesting feature of the Recovery Storage Group is to recover deleted mailbox data. Suppose a user named Joel accidentally deleted important items from his mailbox and he is unable to retrieve this using the “recover deleted items” option in Outlook. To solve this problem please restore the database that holds Joel’s mailbox data into the Recovery Storage Group. 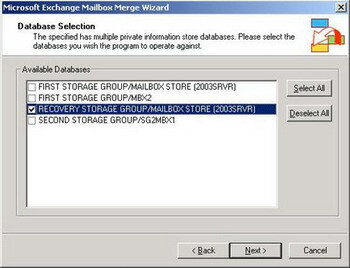 In Exchange Server 2003 in the Exchange System Manager go to the Recovery Storage Group and check Joel’s mailbox. A disconnected mailbox should be visible. Right Click the mailbox and select “Exchange tasks”. 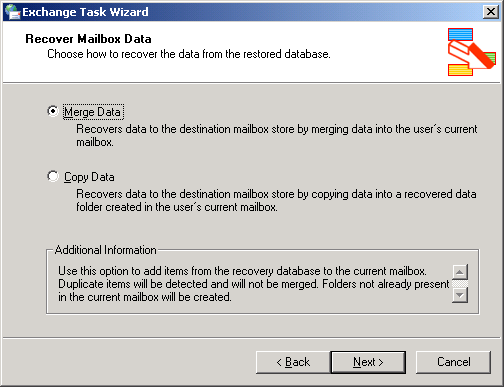 After selecting Exchange Tasks please select “Recover Mailbox Data” (the only option available) and select the destination mailbox store. This should be the database that hold Joel’s mailbox, in this case the “Mailbox Store (2003SRVR)” in the First Storage Group. Copy Data – when you select “Copy Data” the data from the mailbox copy in the Recovery Storage Group will be copied to a separate location, i.e. a special folder named “Recovered Data” followed with the data and time of the recovery process in the user’s mailbox. When finished you have recovered the mailbox data from the backup that’s in the Recovery Storage Group into the user’s mailbox. 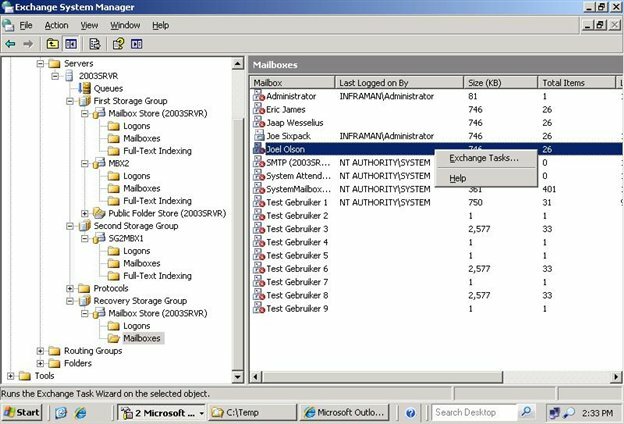 When using Exchange Server 2007 you have to use the Exchange Management Shell or the Database Recovery Management in the Tools option in the Exchange Management Console. Again, restore the database that holds Joel’s mailbox into the Recovery Storage Group. 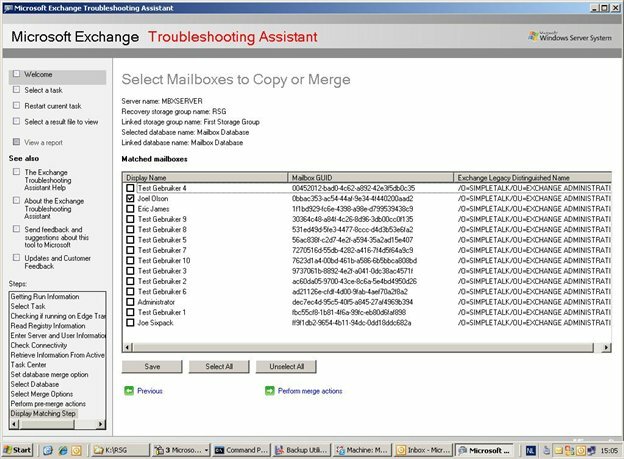 After restoring you can use the Restore-Mailbox cmdlet in the Exchange Management Console to restore the content to Joel’s mailbox. [PS] C:\ >Restore-Mailbox -Identity "Joel Olson" -RSGDatabase "MBXSERVER\RSG\Mailbox Database"
(Joelo@simpletalk.local)'. The operation can take a long time to complete. You can also use the Exchange Management Console to recover mailbox items to Joel’s mailbox. When finished the mailbox data have been restored to their original location. Figure:9. Select the mailbox that needs to be restored. When you need to retrieve a mailbox or mailbox content from a backup set the Recovery Storage Group is a great tool to use. Depending on the task, you have to perform everything in the Exchange Management Console or you may need to perform some actions in the Exchange Management Shell. In both Exchange Server 2003 as well as Exchange Server 2007 it is possible to create a .PST file from a restored mailbox, but in Exchange Server 2007 it’s a bit more confusing because of the usage of the Exchange Management Shell. Before you can efficiently use the Recovery Storage Group and its purposes I would advice to try it a couple of times, to see in what scenario’s it can help you in your day-to-day Exchange Management tasks. Make sure that you document all steps very well. In this case you know exactly what steps to perform when a request is made to restore a single mailbox, either to its original location or to a .PST file. I also suggest users for Shoviv Exchange Recovery manager which provides complete Exchange recovery and migration solution for the corrupted and non-corrupted EDB files, Office 365, Outlook Profile store and Live Exchange Mailboxes into PST, EML, Office 365, and Live Exchange Server etc. For recovering and converting emails now super easy. Visit https://www.ostextractorpro.com/ or https://www.uslsoftware.com/ for more details. Thanks for such an informative article, here I prefer a tool named as Bitdataconversion Exchange Recovery manager which can resolve the Exchange server recovery and migration-related issues.